Excuse us for living, but many of us from time to time wish we could get word to someone famous or prominent. It might be a celebrity, perhaps an author, maybe a politician. Quick! Would somebody please call Spielberg! For the last nine years I have wanted to contact Steven Spielberg for a movie idea perfect for the 2012 one-hundredth anniversary of the 1912 Presidential Election. Right. Try to contact him! Any hope for a film by that anniversary came & went, obviously. 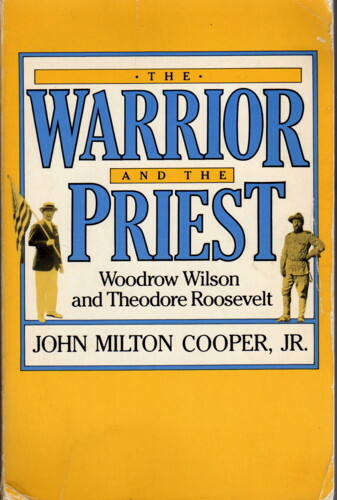 It all started in the early 2000’s when I read “The Warrior And The Priest: Woodrow Wilson and Theodore Roosevelt,” by the prominent John Milton Cooper, Jr., 1983. It’s a very academic discussion of the Progressive Era & the differences on the major issues of those times between TR & Wilson; regulating big business monopolies, eliminating corrupt political machines and bosses, purifying foods and drugs, the labor movement and working hours, and so much more. But what fascinated me were the images of “The Warrior” for Roosevelt and “The Priest” for Wilson, which I transformed into the title, “The Moose And The Professor.” (For TR a take-off of his 1912 Bull Moose Party. For Wilson calling on his image as a professor at Princeton.) – – “What a neat title for a movie,” I thought! And then came along James Chace’s little book, “1912,” which really got my juices flowing as to my movie idea. I was on top of things this time and read the book when it was first published in 2004. 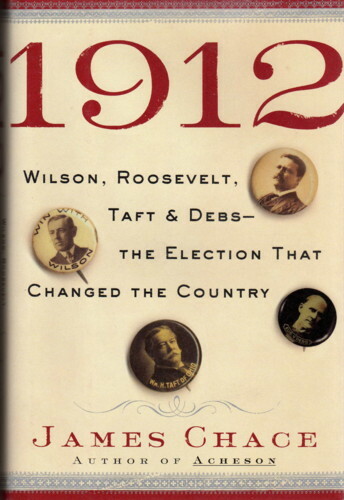 The book had no subtitle, but the jacket cover said it all, “Wilson, Roosevelt, Taft, & Debs – – The Election That Changed the Country.” It was all about this unique election of 1912. The sitting Republican President, William Howard Taft, was being challenged by his predecessor, Theodore Roosevelt, who had hand-picked Taft to succeed him! Added to these two Presidents in what became a spectacle of candidates were the Democratic standard bearer, Woodrow Wilson, Governor of New Jersey, and the Socialist candidate, Eugene Debs, the radical labor leader. 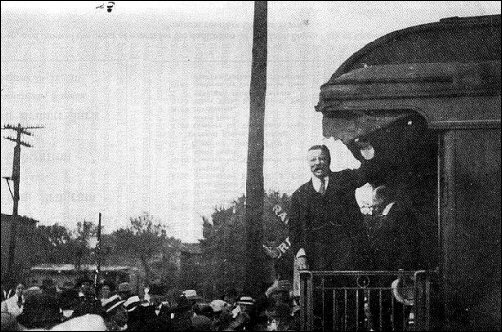 Teddy Roosevelt (undated photo) loved to campaign from the back of a train. As President he also toured the nation by train to the west coast & back. 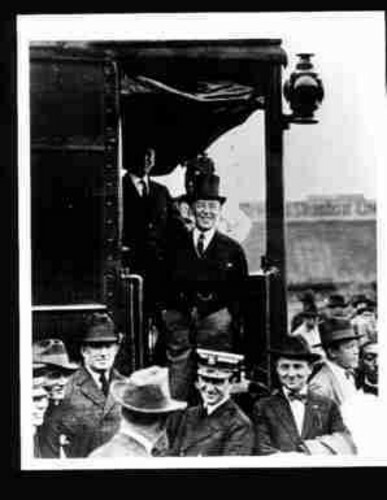 Woodrow Wilson (undated photo) also campaigned from the last car of a train. He famously used this practice as President to gain favor from the American people for his League of Nations. I brought plenty of background to my enthusiasm as a retired history teacher. It all started with Woodrow Wilson as my hero back in my college years as a history major at Rutgers. And then my great appreciation grew over the years for Theodore Roosevelt through my readings on both these giants of the Progressive Era. 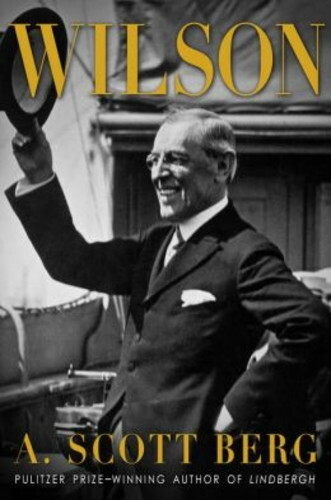 I had already read H. W. Brands’ 1997 book, “TR: The Last Romantic,” and August Heckscher’s 1991 “bible” on the subject, “Woodrow Wilson.” Over the years, I continued my reading about TR & Wilson with the many prominent books previously published & new books that came out. Putting these influences together had me fantasizing all the more with the movie title, “The Moose And The Professor.” – -Either that title or a more traditional choice, “1912.” – – I still prefer “The Moose And The Professor.” But can’t you visualize this? Tom Hanks as Theodore Roosevelt: Besides working with Spielberg on numerous films, Tom Hanks’ list of starring roles & awards is seemingly endless. In particular, his portrayal of the eccentric character, Professor Goldthwaite Higginson Dorr, in The Ladykillers, 2004, is one step away from doing a great TR! John Goodman as President William Howard Taft: To John Goodman’s considerable girth to match that of Taft, his list of distinguished & prominent roles is considerable, more recently The Artist & Argo. Johnny Depp as Eugene Debs: Known for his lesser, eccentric character roles as well as his blockbusters, from Edward Scissorhands to his Pirates of the Caribbean series, Johnny Depp would capture the strange, dark nature of the radical Eugene Debs. Kevin Klein as Woodrow Wilson: Kevin Klein’s maturing look added to his natural demeanor would easily slide him into the part of the professorial Woodrow Wilson. To his long list of hit movies & awards, his portrayal of the President in the movie, Dave, nominates him for this part! These were my castings over the years. And like so many hair-brained schemes, the year 2012 came & went and my idea dwindled into a by-passed fantasy, Then, along came Doris Kearns Goodwin’s “Team of Rivals: The Political Genius of Abraham Lincoln,” 2005, collaborating with Steven Spielberg on the movie, Lincoln, in 2012. As if that were not enough to get my juices going again with hopes of a movie, “1912,” or “The Moose And The Professor,” along came A. Scott Berg’s book, “Wilson,” this past September 10, 2013. Accurate or not, word came out that Leonardo DiCaprio was interested in the book as a possible movie! I knew another Doris Kearns Goodwin book was about to come out any week on TR and Taft so I started to go around saying, “No, no,” to a Wilson movie, & “Yes, yes,” to a movie about the 1912 Election!!! 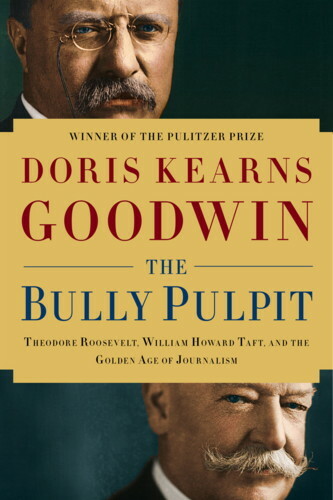 And, sure enough, on November 5, 2013, the much awaited, “The Bully Pulpit: Theodore Roosevelt, William Howard Taft, and the Golden Age of Journalism,” by Doris Kearns Goodwin, was officially published!!! And, as if that were not enough to drive me “bananas,” in an interview with the author herself in the Time Magazine, dated November 18, 2013, the interviewer, Belinda Luscombe, mentions that Doris Kearns Goodwin sold the film option for her new book to none other than Steven Spielberg!!! In the course of the interview, Doris does not deny it. The monumental significance of the 1912 Presidential Election was that the sitting President, Taft, and the former President, Roosevelt, split the Republican vote, thus assuring a Democratic, Wilson victory. Not only would the combined Republican vote have defeated Wilson, but TR’s vote total was bigger than Taft’s! Teddy Roosevelt: TR’s keeping his pledge, with regret, not to run again and anointing Taft as his successor. TR going off on the African safari only to return with great dissatisfaction over Taft’s positions and performance as President. TR’s fight to take nomination from Taft at the 1912 Chicago Republican Convention, only to be rejected & accept the nomination from the Progressive Party, dubbed the Bull Moose Party. And, despite the October 14, 1912 assassination attempt on TR in Milwaukee, lodging a bullet in his rib, without losing a step, TR moves on & delivers his planned address to the cheers of the waiting audience. Woodrow Wilson: A scene on the Princeton University campus with Wilson as Princeton’s President, having just been elected Governor of New Jersey. Wilson confronting the political bosses of the State. Wilson’s rapid passage of his Progressive reform agenda by the New Jersey Legislature in his first months in office. Then after barely two years in office, Wilson off on the 1912 presidential campaign trail. Can you see it all???!!! – – TR’s Progressive programs that he called the “New Nationalism” vs. Wilson’s Progressive programs that he called the “New Freedom”! – – And the obvious comparison that little has changed from the politics of 1912 to our present day political scene: with the Republican Party entrenched by the conservatives at odds with Party moderates; & the Democratic Party with its “big tent,” inclusive public appeal, nominating liberals attempting to run as moderates. 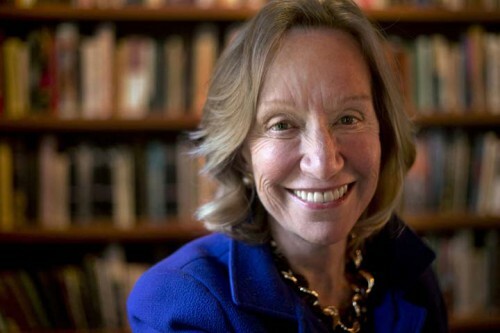 Monday, October 7, 2013 photo of Doris Kearns Goodwin in her home in Concord, Massachusetts. Excuse us for living, but sometimes you just “have to do what you have to do.” And when Steven Spielberg turns Doris Kearns Goodwin’s “The Bully Pulpit” into a movie, I know not what he will title the film. But I would not be surprised if the crux of his movie is all about the 1912 Presidential Election. I know nothing about U.S. History as I am not a history student and dont’live in the U.S., so that made this piece extra interesting. It’s a little involved, but I am tempted to read up more about this election. Nice going! But who would you cast for the key figure of this “Golden Age of Journalism”, the pioneer Muckraker and magazine publisher S.S. McClure? Coincidentally, this summer my wife and I visited his home stomping grounds in County Antrim, Northern Ireland, where he lived until the age of nine. McClure is my wife’s great-great uncle on her father’s side. 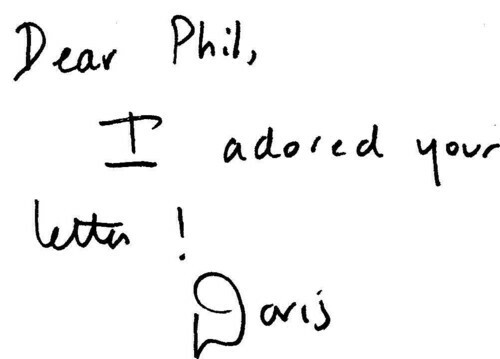 Very interesting Phil. As a matter of fact, my interest in this subject was piqued this year when I saw a piece on CBS Sunday morning on Woodrow Wilson. I began Internet surfing and also learned of the two books you mentioned, which I plan to read. I also saw the Charlie Rose interview of Doris Kearns Goodwin and was convinced I needed to read her book. So having said all that, you go boy, love your ideas for the movie. And good for you for passing on your ideas to Doris. They are kindred spirits for sure. Not only do they vaguely resemble each other but they share a personality type (ENTP) according to the Myers-Briggs Type Indicator. Plus Tom has proven to be sublime in historical roles (ie Disney, in Saving Private Ryan) and is definitely a history connoisseur; he worked on Band of Brothers and the Pacific with Spielberg and they are soon to start a third WW2 mini-series about the air battle. Also Tom Hanks Has a son named Truman THEODORE, coincidence? I think not. but seriously, as soon as I heard about dreamworks buying the rights to the Bully Pulpit all I could think of was Hanks as TR. and also John Goodman as Taft- excellent call! Id be interested to see if Kearns had anyone in mind. ahah but if you still have those addresses I would love to follow up your letters with ones of my own! Ely, Your enthusiasm for my idea & castings are most encouraging far beyond the kind words of others!!! I was not familiar with the ENTP type personality re Myers-Briggs. –A riot what you reveal about Tom Hanks’ son’s name! And his collaborations with Spielberg on historical topics IS impressive. Glad you like John Goodman cast as Taft. I can just see that too! Addresses: For Doris Kearns Goodwin, I addressed my letter to her hometown, Concord, MA 01742. But her note came with a return address adding a house # & street; 1640…..& then looks like maybe “Monument” as the street name…..difficult to read her writing…..or “Monuant.” –Can’t be sure. Steven Spielberg I used his New York address at #145 & 146 The San Remo, 13th floor, West 74th & 75th Streets, NY, NY 11754. And Tom Hanks’s production company, Playtone, PO Box 7340, Santa Monica, CA 90406. Follow them on Facebook and Twitter. I think it’s amazing the number of celebrities that are on Facebook and Twitter, and actually interact with their followers. Romantic, exciting and visionary. Then you must add “When the Cheering Stopped” and a biography or two of William Jennings Brian to complete your scope of understanding. I am delighted we met !